While driving north on I-5 through Oregon, I paged through an Oregon tourist guide looking for a good place to stop for lunch. We decided on Salem, with the fabulous Riverfront Park next to a children’s museum. Admission is $5.50 for adults and children 3 and up. Discounts f or younger children, seniors, and those on public assistance. I should preface the rest of this post by saying that a heatwave struck Northern California and Oregon the day we left home. Driving wasn’t a problem, because we had A/C, but we spent a miserable night camping in Southern Oregon and all of our stops were unpleasant at best. The Discovery Village had an A/C system that probably works fine 99% of the time, but wasn’t quite up to killer hot days like we had and was uneven. Also, it’s not a building, it’s a complex. Many of the exhibits are outside and you have to go outdoors to get from one building to another. It was not family fun at its best. Miriam had a wonderful time though. 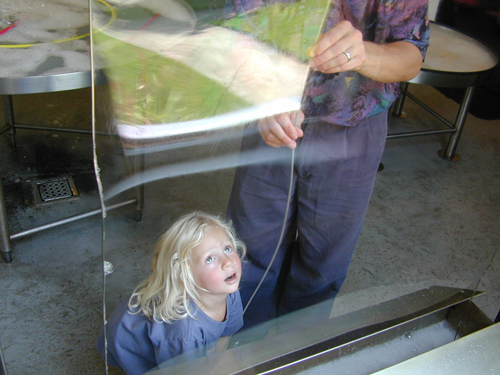 The first room had many devices to make bubbles, including this one as big as a picture window. 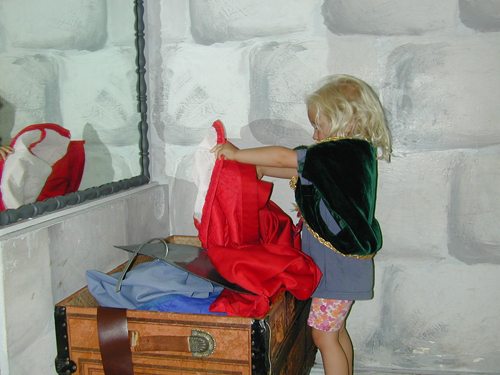 Miriam then crawled through a giant mouth in the human body exhibit, insisted on a prolonged stop in the toddler room, and made her way upstairs, where she found the castle room, with dress-up clothes and a stage. It took some doing to pry her away. Alas, the heat kept me from taking more pictures but Miriam enjoyed the China room (where older girls visiting the museum insisted on sitting us all down at the table and serving us a pretend lunch), a play grocery store, and a giant train set. There were also swings and a huge (and impressive) climbing structure outdoors (Miriam needed supervision in it but, fortunately, adults fit fine). Disabled accessibility: limited. There are ramps leading to each building but only stairs going to the upper stories, where large numbers of exhibits are. 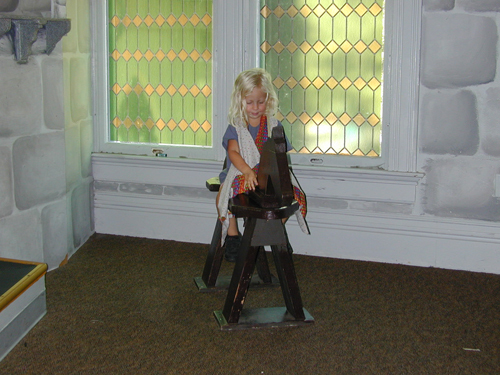 The exhibits themselves are not geared for use from a chair. I couldn’t use the bathrooms there because there was a strong air freshener or cleaner scent that came from them each time we passed by. The air quality inside the buildings was fair. Aside from the bathrooms, there wasn’t anything terrible that I noticed. I got a headache while I was there but it’s unclear how much was from the heat. Most of the exhibits are older and don’t have the technology that more modern museums have. Some of the exhibits (or components of them) aren’t functioning properly. Yet Miriam talked about this place for days. She really enjoyed herself. I’d say that anyone 2-6 years old would have a blast. Younger kids still have a few things to do and older kids would have fun if engaged in specific activities.